The last few summers I have spoiled myself and invested in one super fun, really nice romper. Last years was a bright and colorful piece by Mara Hoffman and this years is this boho chic romper by Spell and the Gypsy. I had never heard of the brand until recently but when I found them it was love at first sight. My only problem after buying it was finding jewelry to go with it. I recently had to do a massive jewelry overhaul and find all new pieces. This was not at all by choice either. When I was flying Delta a few months ago I am pretty sure an employee stole my jewelry bag out of my suitcase and I lost almost everything I owned, except what I was wearing and a few pieces I had left at home. Insurance covered some of it. Delta covered none of it. It was incredibly sad to lose pieces I had invested in over the past 10 yrs. It was hard, but such a good reminder to me that what matters in life is not what we have. God gives and he takes away and he is good. To complain about jewelry being stolen is so small in comparison to all I have been blessed with and it gave me time to reflect on what is really important. I decided that I would use this opportunity to be thankful for the heart check and to be thankful that insurance covered a little over half of what I lost. It was still a decent amount of money to replace what was stolen and I had a chance to be strategic about getting pieces I would really wear everyday. I knew I wanted pieces that were playful, unique, versatile and super wearable. When I found this Arya choker from Jules Smith I knew it had to be one of the pieces I owned. It was dainty but with a bit of flair and I knew it would be perfect to dress up or down for every day wear. The Delta studs had the same playful feel with the asymmetric sizing (one stud is larger than the other). I knew right away this necklace and earring pairing would be perfect with my new summer romper. 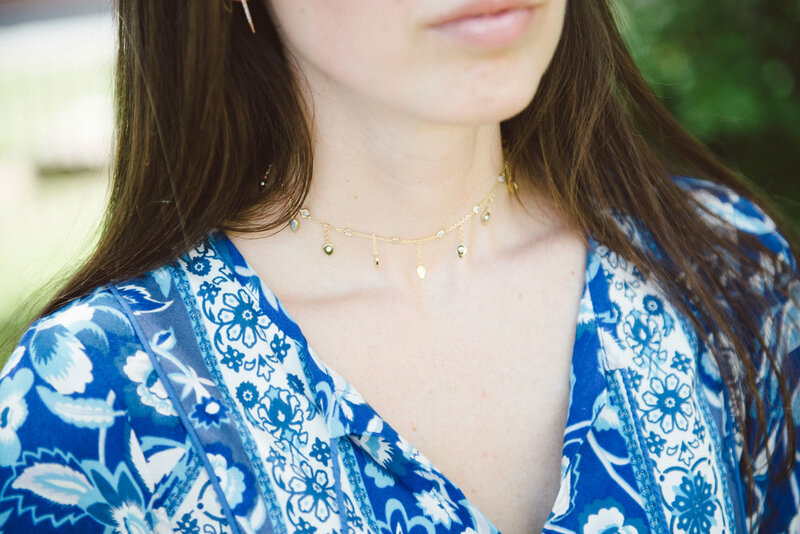 The tiny playful charms on the Arya choker had that fun summer boho feel and the Delta studs added the finishing touches. I am slowly rebuilding my jewelry wardrobe and Jules Smith has so many cute pieces that I know will become daily staples. Make sure you check them out! *Thanks Jules Smith for sponsoring this post! Jul 26 How to Wear a Crop Top in Your 30's With Class. Nov 23 How I Wore Hair Extensions For an Entire Month Without Even My Husband Knowing!